Coin Investors: Take Advantage of a Much Overlooked Market Segment! Various Ways to Invest in Gold, Silver and Other Precious Metals Having “F.U.N.” at the Bourse! Coin Investors: Do you want to buy when coin prices are already going up…or do you want to buy when coin prices are soft…before they begin rising?! One area of the rare coin market that’s been out of favor, but is beginning to gain attention again, is the market for Early Commemorative coins struck by the U.S. Mint. These are legal tender silver half dollars coined between 1892 and 1954. A few other denominations also make up this fun and very collectable market segment. They are the silver Isabella Quarter, struck during 1893; the Lafayette Dollar, a silver dollar from 1900; and several commemorative legal tender gold coins in denominations of $1, $2.50, and $50 – one round and the other octagonal in shape. These “Early” Commemorative coins are differentiated from “Modern” Commemoratives that have been issued by the U.S. Mint since 1982. The Early Commems been popularly collected for generations. Unlike regular issue U.S. coins, these legal tender commemorative coins have an interesting historical story that goes with each issue, such as the Sesquicentennial of American Independence from 1926, or the popular Oregon Trail Memorial half dollars issued between 1926 and 1939, for example. Early Commemorative coins were just beginning to once again attract the attention of dealers and investors who were buying them up as the coin market paused when the economic meltdown began in 2008. In the bull market in coins during the 2000s silver commemorative coins took a back seat to other areas of the coin market, like rare gold, high grade type coins, and scarce dates of traditional series. 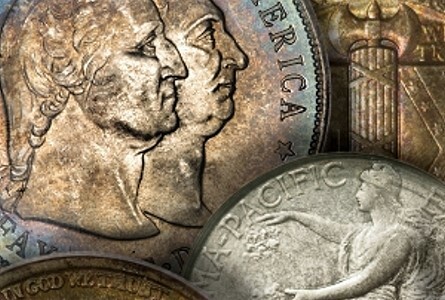 Several dealers recognized that prices for Early Commems were cheap in comparison to these other market areas and began building inventories of these coins during the year or two that preceded the financial meltdown. Looking back – the whole coin market experienced a bubble in 1989. PCGS and NGC were only three years old, and encapsulated, third-party coin grading was still in its formative years. Wall Street was making inroads into the coin market, but it just didn’t take hold at that time, and the whole coin market primarily went through an adjustment phase during the 1990s when coin prices settled into a healthy collector-driven market as compared to the investor-driven market of the 1970s and 1980s. Then, during the early 2000s, the coin market took off and prices began rising for traditional series of rare coins, like rare gold coins, early “type” coins minted between 1792 and the mid-1830s, and classic series, like scarce high grade Buffalo nickels, for example. Within the bull market cycle in rare coins, during the 2000s, most series of coins rose in value at different times – high grade Buffalo nickels had their day, the early silver dollars of 1794 through 1803 had their day, and other series like early copper coins and Saint Gaudens twenty dollar gold coins had their day – all at various times during that bull market period. Again, Early Commemoratives were just at the beginning stages of coming into their own. Now, as the coin market and the economy recover, collectors and investors are looking at what coin market segments offer opportunities. Some dealers and investors have been moving into the area of Early Commemoratives because their prices are low as compared to coins of similar qualities and scarcities, and except for the very high end exquisitely toned Early Commemoratives, prices didn’t rise much during the bull market of the 2000s, like prices did for most other rare coins. Another huge factor that is being considered is the fact that thousands of newer collectors, who may have begun collecting and buying coins when the State Quarter program began, have been buying “Modern” Commemorative coins from the U.S. Mint. Some of these collectors and investors are discovering the beautiful designs of the Early Commemoratives and the fun and potential profit of collecting these earlier counterparts of their “Modern” collections. This is a huge potential market of Early Commemorative buyers. So, the combination of an overlooked market segment during the bull market in coins of the 2000s, which resulted in low prices for “Early” Commems as compared to other rare coins of similar quality and scarcity, and the potential market of thousands of collectors and investors in “Modern” Commems, many dealers and investors are taking a serious look at this area of the coin market for future promise. Early Commemorative coins also have a solid base of collectors who enjoy the individual stories behind each historical commemorative issue. They are an investment that a person can have fun with, as well as feel comfortable that their prices at these low levels have a base of support that provides relatively low risk, if for no other reason than they didn’t experience the large run-up in prices that many rare coins went through during the bull market of the 2000s. Another investment factor the coin market is utilized for is protection from inflation. Fortunately our economy has been able to escape the devastation of rising prices since the last inflationary period of the 1970s. There’s a whole generation of people who don’t know what it’s like to live through a period of sustained rising prices for personal goods, like food, clothing, household goods, and gasoline. There are many economists and sophisticated investors who believe there’s no way we can escape another such period of devastating price rises in the economy – it’s inevitable. It seems like inflation has been cured because we haven’t had to live with this major problem for 30 years. However, many qualified professionals believe that our national debt has risen just too high to keep inflation in check much longer. During the last inflationary spiral of the 1970s the coin market was one area in the economy that investors turned to for preservation of their assets and for profit. These days, the wealthy are doing the same – just take a look at record prices for rare coins on the high end. There are now three rare coins that have sold for more than $7 million each! Lastly, in today’s coin market we’ve seen that in major auctions and in the coin market in general, those coins that are preferred by investors and are selling for the strongest prices are for coins that have been graded by PCGS and verified and stickered by CAC, Certified Acceptance Corporation, which affixes green, oval-shaped and hologramed stickers with the “CAC” logo to the holders of NGC and PCGS graded coins. Such CAC verifications offer third-party evaluations that the stickered coins are solid and high end for given grades of coins, not for those that just barely make a grade. Investors and collectors should consider how the market will accept their coins when the time comes to re-sell them. For the above reasons, many dealers are recommending CAC verified coins, as I do with the Early Commemoratives I offer on my website. CAC verified coins are generally selling for premium prices over and above those with only a grade from PCGS or NGC, because they are considered above average premium-quality rare coins. It’s easy to buy rare coins, but buyers should consider the market when it comes time to sell.